The German Christmas season officially begins with the first Sunday of Advent. Stollen, the oldest known German Christmas treat, and Christmas cookies (Plätzchen) are often baked during this time. Gingerbread houses, nativity scenes, hand-carved wooden Nutcracker figures (Nussknacker), Christmas pyramids (Weihnachtspyramiden), and lighted city streets and homes are all signs that Christmas is on its way. The Advent wreath (Adventskranz) is adorned with four candles, one of which is lit on each of the four Sundays preceding Christmas. The first Advent wreath, which appeared in the mid-19th century, had 4 larger candles and 19 smaller ones. Each day one additional candle was lit to help the children count the days until Christmas. Today only the four larger candles remain. However, the tradition has been exported to many other countries around the world and was adapted to existing customs. The Advent wreath of the Eastern Orthodox Church uses 6 candles to last through its somewhat longer Advent season. The Advent wreath has been attributed religious and elemental significance. The tradition of a ring of light existed among the Germanic tribes many centuries before the celebration of Advent. It is believed that fewer candles were lit with each progressive lighting to represent the shortening of the days until the solstice, at which time the Julfest celebrated the return of light. (Incidentally, the English word yule is a cognate with the Germanic Jul). The Advent calendar (Adventskalender) is a German invention that was originally designed to involve children in the festivities leading up to Christmas. The calendars are usually made of cardboard and have 24 small windows or flaps, one of which is opened on each day leading up to Christmas. Behind each window is a Christmas scene or motif. 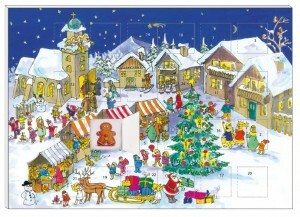 Nowadays, calendars may contain chocolate or candy behind each window, and sometimes even small toys. The Advent calendar is a more recent invention of modern capitalism. Originally, families would mark the 24 days of December preceding Christmas with a chalk line on the wall. The first hand-crafted Advent calendars were produced in the mid-19th century; the first printed calendar appeared in Munich in 1903. Eventually the custom was exported all over the world. When the Advent season opens, Christmas markets also crop up in nearly every German town, large or small. The town squares, normally dark early in winter months, are lit up and buzzing with activity during this time. Townspeople gather together, listen to brass band music, drink beer or hot mulled wine (Glühwein) or apple cider, and enjoy the hearty traditional fare of the region. Vendors peddle baked goods, including gingerbread hearts, sugar-roasted almonds, crepes, cookies, stollen, cotton candy and other sweets. Christmas tree decorations, seasonal items, and handcrafted articles, such as wooden toys and hand-blown glass ornaments, are also sold. 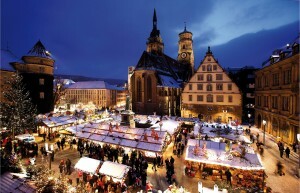 Christmas markets date back to at least the 14th century and were one of the many markets held throughout the year. It was here that people bought everything they needed for the Christmas celebration: baking moulds, decorations, candles, and toys for the children. In fact, until well into the 20th century, the Weihnachstmärkte were the only place for people to buy such seasonal items. Markets differ from place to place; each has its own regional imprint. The market at Aachen, for instance, is known for its gingerbread men (Aachner Printen). The regions around the Erzgebirge mountain range are famous for their handmade wooden crafts. Augsburg has a life-sized Advent calendar and opens the holiday season with its famous “Angel Play.” At the Frankfurt Christmas Market, visitors will find Quetschenmännchen (little prune men) and Brenten (almond cookies). The most famous Christmas market is the Nürnberger Christkindlesmarkt, which is known for its gold foil angels and locally produced gingerbread cakes. At least 375 years old, it is one of the oldest, and with over 200 vendors participating each year, it is also one of the largest Weihnachtsmärkte in Germany. St. Nicholas Day is celebrated on December 6th in Germany as well as in other European countries. On the evening before the 6th, children place their newly cleaned shoes in front of the door in the hope that Nicholas might fill them with nuts, fruits, chocolate, and sweets. If the children have behaved well, their wishes will be fulfilled. Children who have caused mischief will receive only a switch, which symbolizes punishment for their bad deeds. The real St. Nicholas lived in the 4th century and was the bishop of a region located in present-day Turkey. Through stories and legends associated with him, he became known as the protector of children and the anonymous bestowed of gifts upon them. Over the centuries, the life and deeds of St. Nicholas were celebrated on the saint’s appointed day, the 6th of December. 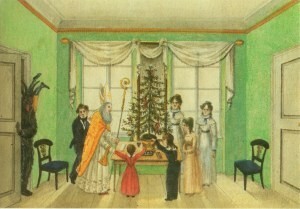 By the Middle Ages, the observance had already become a celebration of children and a day on which they received gifts. It was the German Martin Luther who sought to sever the connection between the saint and the gift-giving celebration for children, because in his Reformation theology, there was no place for the glorification of saints. Rather than abolishing the custom outright, Luther replaced the persona of Nicholas with that of the Christ child; in his Protestant teachings, not Nicholas but rather now the baby Jesus was attributed with bringing the children gifts, and not on the saint’s day but rather at Christmas. Today in many regions of Germany, not Saint Nick, but rather the Christkindl leaves Christmas gifts for children on December 24th. The adherents of the Catholic Counterreformation did not quietly accept the diminishment of their saint. They responded to the practices of the unorthodox Protestants by making Nicholas a figure who visited families’ homes on his appointed day and stood in judgment over children. If the young ones could answer religious questions and said their bedtime prayers faithfully, they received a gift from the sack that Nicholas’ companion, Knecht Ruprecht, had slung over his shoulder. Those that slacked in their religious commitments got the switch or were threatened with being hauled off in Ruprecht’s sack. Today children in all the German-speaking regions, regardless of religious denomination, celebrate Nicholastag. Ruprecht, who typically carries a basket filled with edible goodies for the children (and also the switches for the naughty children), has become Nicholas’ constant companion. In German-speaking Switzerland, Ruprecht is known as Schmutzli. The figure of Santa Claus, known in Germany as der Weihnachtsmann (literally, “the Christmas man”), is a direct descendant of Saint Nicholas, as can easily be seen from the derivation of the name “Santa Claus”. The English appellation came directly from the Dutch variant “Sinterklaas”. Centuries-old Northern European tradition also knew a similar figure – a bearded old man in a long, brown, hooded fur coat who traveled on a reindeer-drawn sled. Carrying a staff and nuts, respectively symbolizing fertility and non-perishable, substantial nourishment, this figure from Lapland represented preparation for the long winter season ahead. This figure likely in turn descends from the god Thor or another deity from Germanic mythology. Many of the characteristics attributed to the modern-day Santa Claus are easily recognizable in both the St. Nicholas figure and the personality descended from old Germanic folklore. 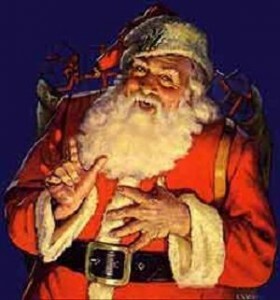 The Weihnachtsmann, much like Santa Claus, is depicted as a jolly old man with a long white beard in a red fur suit, with a sack of presents and a switch. On Christmas Eve he leaves gifts for the well-behaved children and punishes those who have been bad. He doesn’t arrive through the chimney, but rather slips in and out just long enough to leave the gifts, usually before children can catch a glimpse of him. Depending on the German-speaking region, today it is either the Weihnachtsmann or the Christkind (Christ child) who leaves gifts for the children to open on December 24th in Germany. will auch immer artig sein. The German Tannenbaum is usually put up and decorated on Christmas Eve, though some families opt to erect their tree during the Advent season. 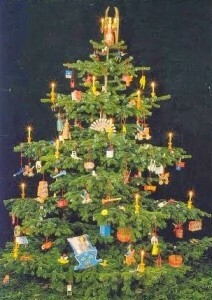 Traditionally, the Germans used the fir tree, but nowadays the spruce is widely used. Decorations may include tinsel, glass balls or straw ornaments and sweets. A star or an angel tops the Tannenbaum, and beneath the tree, a nativity scene might be set up and the presents next to it. Germans also usually continue to use real lit candles instead of electric lights on the tree. The first known Christmas tree was set up in 1419 in Freiburg by the town bakers, who decorated the tree with fruits, nuts, and baked goods, which the children were allowed to remove and eat on New Year’s Day. The town guilds and associations first brought evergreens inside their guild houses and decorated them with apples and sweets. Candles were eventually added to the decorations. Already since the Middle Ages, ordinary Germans had been bringing yew, juniper, mistletoe, holly, evergreen boughs – any plant that maintained its green color through the lifeless and dreary winter months – into their homes. Even in areas where forests were sparse, the tradition took hold; people in Northern Germany, for instance, used Christmas pyramids (Weihnachtspyramiden) in lieu of Christmas trees. The pyramid form was created using sticks that were then decorated with fir branches. By 1800, the custom of bringing a tree into the home was firmly established in many German-speaking regions and continued to spread throughout Europe, and eventually, around the world. The custom was brought to North America by German-speaking immigrants to Pennsylvania and Ohio in the 18th century. The Tannenbaum is taken down on New Year’s Day or on January 6th, Three King’s Day, at which time the children can ransack the tree for the sweets and treats that decorated it. December 24th begins as a regular workday. But by 2:00 pm, often even earlier, businesses close in preparation for the holiday celebration, a large part of which occurs on Christmas Eve in Germany. The traditional evening meal includes carp and potato salad. 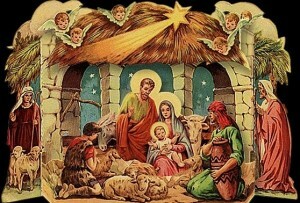 Families sing Christmas carols together and may read the story of Christ’s birth aloud. Family members exchange gifts; children are typically the focal point of the gift exchange. The tradition of opening gifts on Heiliger Abend (rather than on December 6th in honor of St. Nicholas) was started by Martin Luther in the 16th century in favor of a celebration that honored Christ rather than a Catholic saint. On Christmas Eve, German families – whether Protestant or Catholic and even those who are not regular church-goers – often attend mass or a church service. While the mass traditionally takes place at midnight, in recent times the services have moved into the earlier evening hours. Both December 25 and 26 are legal holidays in Germany and are known as the First and Second Christmas Day respectively. What originally started out as a church celebration of Christ’s birth has gradually become a family celebration. Businesses are closed, and time is spent visiting with extended family. Goose is the traditional fare on the First Christmas Day, or perhaps rabbit or a roast. These are accompanied by traditional German fare such as apple and sausage stuffing, red cabbage, and potato dumplings. The second Christmas day is usually a quieter time, a day for peaceful contemplation.